Hmmm.... maybe I could get a forum for them going if there's interest. Anyone else interested in a novels discussion forum? Ah , If i would have known that answer before, I wolud have given the thread a better title, so people already know whats the purpose of this thread, before they open it. Could you change the title in " Do you want a novels discussion forum?" or something like that ? I don't want to sound negative or anything, but I don't think it could be very active. Once in a while, a thread about certain QL novel appears, but it seems to me that it's only a few people who know about them (and sometimes those people are not so active themselves), so it wouldn't work, in my opinion. A single thread would be more effective. I think Night Terror is right. Why do many people not know about the novels? The title has been changed - let's see what interest there is first. I didn't know there were novels until I checked out the main site. I wouldn't mind a forum for the novels, if, as mentioned before, there is enough interest to keep it going. I mean, there are, what, 18 novels? Should be plenty of room for discussion. In fact, maybe a part of the new subforum could be threads that are book discussions -- one thread per chapter. And we could all read the books together or something... They have something similar on the Harry Potter forum for Leaky Cauldron. It's like a book club. And perhaps, if we need more activity in the novel subforum, we could expand it to include any novels that have something to do with time travel or something. This would be an interesting forum. The only problem for me is that I don't own the novels, so I don't think I'd have much intelligent input that could be added to the discussions. Well, mainly because they're not available in their countries or they could be very expensive, but sometimes people simply aren't so interested in the idea of a book based on a TV show, mostly because they could be classified as formula-driven "fan" fiction written and published just to make a quick buck, and they don't trust the authors. No offense to the people who like fan fiction, but I think it's only a matter of ideas and tastes, and, like I said, I believe only the few people who are familiar with the novels could be attracted to a single thread about certain book, but an entire forum about all of them could be a waste of space, in my opinion. And, seriously, how active can it be? I hate to say it, but this whole messageboard is not so active, to begin with, and an entire forum where there will only be a few people and, most likely, a forum that will be almost hidden (take a look at the fan fiction forum: the last post was made a little more than a month ago), well, it would be more scrolling down, everything could be slower, etc. But well, who knows, I could be wrong. 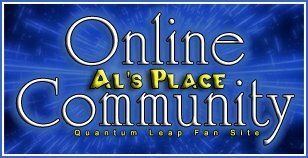 Looks like we have a new forum! Have a look - let's start filling it with interesting discussions! Wow. I'm going to have to pore over some of these topics, and see if I can find these novels. I am glad to see the new forum! A few weeks a go I was searching old posts to see opinions of the different novels. This way its much easier to find. GREAT idea to put existing threads into the new forum! Kudos to the admins and mods - the new forum happened quickly, and I was impressed that you went back and moved in the existing threads about the novels. Now I'll HAVE TO buy the novels. Already checked the library and they don't have them in their catalog. It's just a matter of seeing it now, I suppose. I hope I was wrong. I've added threads about each novel now here in this forum - hope that makes it even easier to navigate! Now I am going to have to buy these novels. I enjoy reading the Quantum Leap Virtual Seasons, so I'm sure I'll enjoy these as well, since these are also probably all "traditional" leaps, if you will. Then I'll be sure to discuss them.